I was on the train back from a meeting in London with some colleagues, and the subject of this blog came up. It is bizarre really, it isn’t something I usually talk about at work, two separate worlds if you like, despite us writing it (daily) for more than 10 years. Anyway the point is I would have put us down as snack experts, so when I was asked; “but why haven’t you written about Smash”, my first thought was the instant potato. I really couldn’t believe there is a chocolate based snack that hasn’t crossed my path… but I was to be enlightened on this train journey. It came highly recommended. After a bit of a search it turns out you can import Smash via Amazon, or it is available on Ocado. 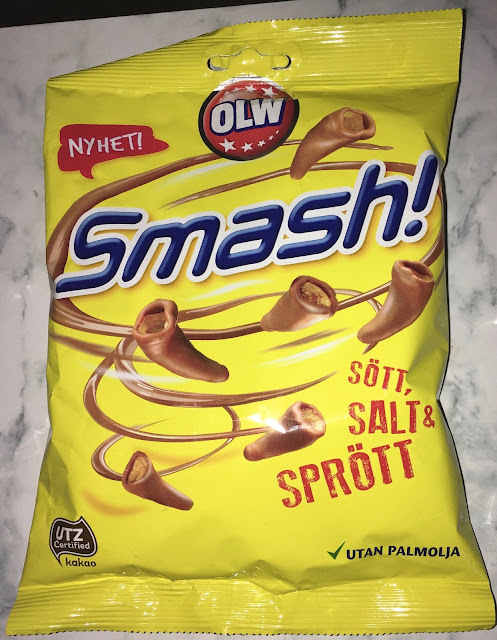 Smash is a Norwegian product that mixes sweet and savoury. 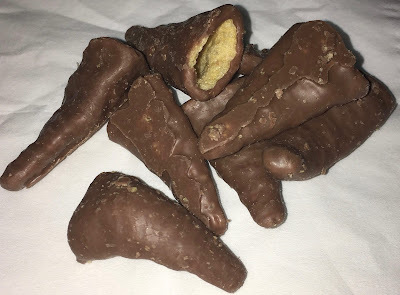 It consists of a hollow cone of salted corn snack dipped in chocolate. I love sweet and salty popcorn, and this looks like it will be similar in concept for the taste. The Smash pieces are very light and crispy. The corn taste is unmissable, with this and the salt and thick sweet milk chocolate my tastebuds were over moon with the combination. The texture is very light and crispy and each one of these Smash nuggets sort of disappears and leaves you wanting another. It is very easy to munch through an entire bag. The salt and sugar combination worked, teasing the taste buds with what might come next. I am hooked, and have already ordered another bag of Smash. The only thing that doesn’t make sense is how and why the Norwegians are keeping this Smash chocolate to themselves? This deserves to be far more readily available and known about in the UK.